James Stagliano was best known for his expressive style of playing and his great high register, and he was the first hornist to record the high baroque music of Steinmetz, Barsanti, Handel, and Telemann. For a time, he held the record for the highest note recorded on a horn, an E-flat (concert A-flat) in the cadenza of a the Mozart Concert Rondo. He was a great lyrical player and truly representative of the style of cantabile playing taught by the fine Italian musicians of that period. Stagliano was born in Italy in 1912 and emigrated to the US as a child. He first learned piano, then studied horn with his uncle. His father, a trumpeter, also gave him some training. At age 16, Stagliano joined the Detroit Symphony as assistant principal horn to his uncle. 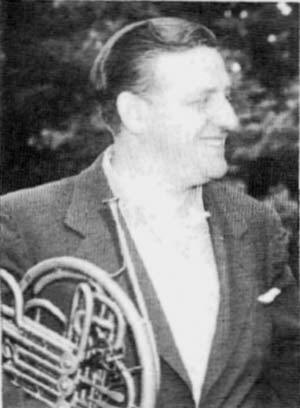 He moved to the St. Louis Symphony as principal horn, then in 1936 to Los Angeles, where he played in the Los Angeles Philharmonic until 1944 and became a leading player in the studios, especially Fox Studios. His movie credits include Gone With the Wind and Fantasia. He left Los Angeles to play in the Cleveland Orchestra under Leinsdorf, but after a year was persuaded by Koussevitzky to join the Boston Symphony, where he stayed for a remarkable reign from 1947 to 1973. He founded Boston Records and, with Sarah Caldwell, the Opera Company of Boston. Stagliano reached many players through his recordings and broadcasts, although his recorded legacy suffers from primitive recording techniques and little or no splicing. He was a natural player and had few students, but he did have some advice. He recommended standing up while practicing because of the natural support this provides. He felt that the best horn playing has "repose," by which he seemed to mean savoring each tone to the maximum, avoiding any sense of urgency or compulsion to get through. He refused to let a poor performance bother him, and he advocated relaxing when away from the horn. Stagliano played an Alexander double horn for nearly everything except Bach, for which he used a Kruspe single high F horn. He was elected an IHS Honorary Member in 1981.